We’ve had no rain here in the Sonoran Desert since before we arrived in November. 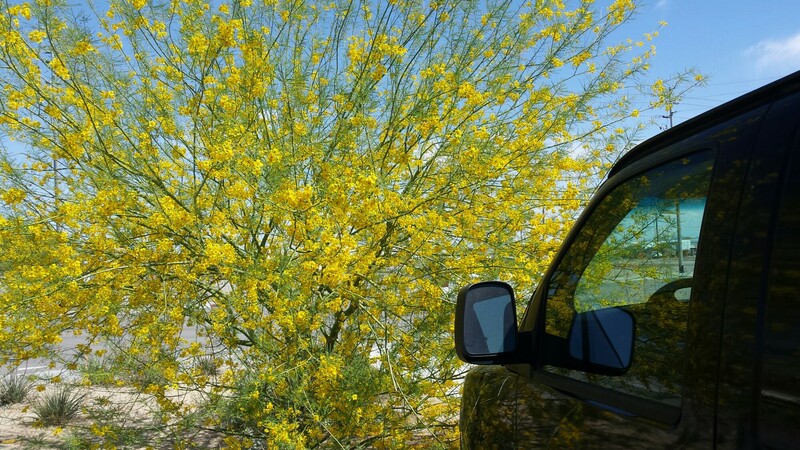 But one of the creosote bushes has graciously offered to be our Christmas tree this year. After a summer at D & W Lake Campground in Champaign Illinois that saw 33 medical appointments, procedures, and various recovery periods between the two of us, we were eager to leave that environment for the relaxing open skies of the southwest. So, the minute we got the OK from the doctor on the last proceedure in mid-November, we took off and went straight through to Arizona. It’s so nice to be here on the gravelly desert at LaPosa LTVA near Quartzsite Arizona. After spending the summer with a full hookup, it didn’t take long to switch into full boondock mode. Including near full reliance on solar energy. We did have to replace one of the two new batteries we bought last spring – free under warranty. And we had to endure the unstopping of a clogged black water tank. But, with our fingers crossed, we are settling in for a nice quiet relaxing winter in the Arizona southwest. Standing outside on a clear day around lunch time recently, the peace was interrupted by screams and a flapping that resembled a jet engine. At a camp site a little way away there was a small tornado tearing apart the ongoing lunch preparations for a group and trying to destroy their canopy. The dust rising in the swirling column of air included lunch debris and looked like smoke. Screams started coming ftom the next campsite in the dust devil’s path. But just as it a arrived there, it rose high enough to spare them. In touring the area later, it was obvious that the dust devil had destroyed a tent in a campsite before arriving at the luncheon group. This episode reminded us of a time some years ago when we were camped at the Great Sand Dunes National Park in Colorado. We had strapped our awning to the picnic table in case of wind even though it was a peaceful calm day. Sometime in the afternoon while we were sitting in the trailer reading, we were shaken by a gust of wind and we could see the picnic table through the window rise off the ground almost as high as the top of the trailer. Almost immediately afterward, everything was back to normal as if nothing had happened. Although we were still breathing hard. We’ve seen dust devils in fields many times and they seem so peaceful but they can pack a punch. 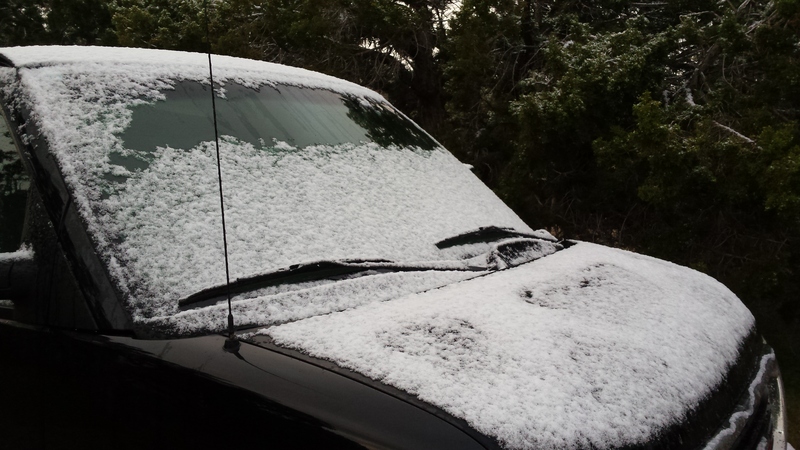 We woke up this morning to a rare occurrence in May in the Sevier Desert south of Salt Lake City Utah – snow. If we had continued on our northerly journey to our planned forest campground stay in the Logan canyon east of Salt Lake City, we would have had over 5 inches of snow along a flooded river. 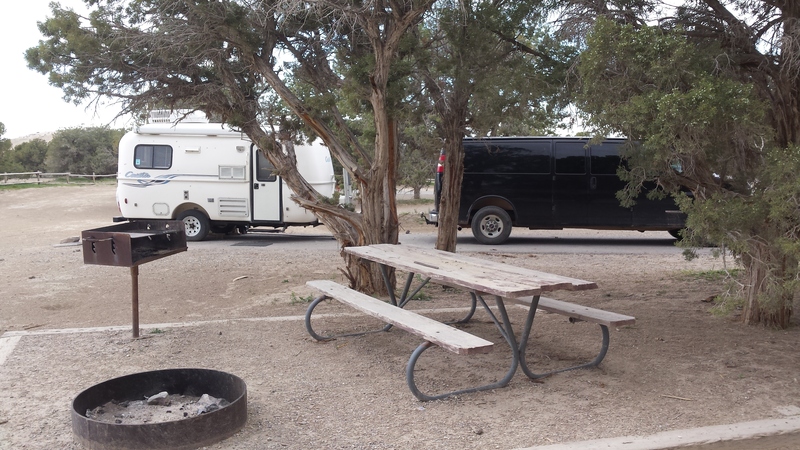 We are thinking this is a pretty nice place to be right now with our asphalt parking space surrounded by trees with Internet, phone, television, and an annual pass to the recreation area making the rest of our stay free up to a year from now! 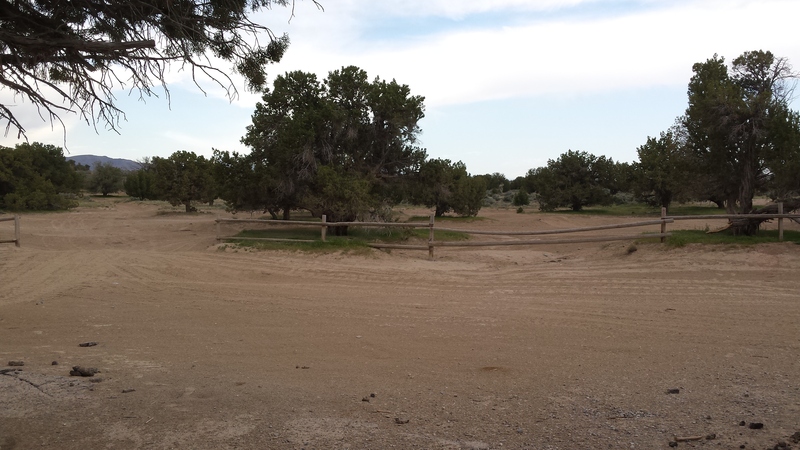 We are in one of the four campgrounds in the Little Sahara White Sand Dunes Recreation Area in Utah’s Sevier Desert which also boasts the Bonneville Salt Flats east of Salt Lake City. The Little Sahara, located south of Salt Lake City, is a popular off road vehicle playground on the sand dunes mostly on weekends. The land is managed by the Bureau of Land Management. The first site we were in was a little too close to the action. It was great for people watching over the weekend. There were many different types of vehicle, ages of riders, and sexes. Some of the little ones could hardly reach the floor but they hung on to the hand grips and away they went. We moved to an interior site that is out of the main traffic pattern before the next wave starts coming in on Thursday and Friday. The snow melt floods will recede and campgrounds will begin to open this Sunday so we will be heading to National Forest campgrounds then as we gradually head north. 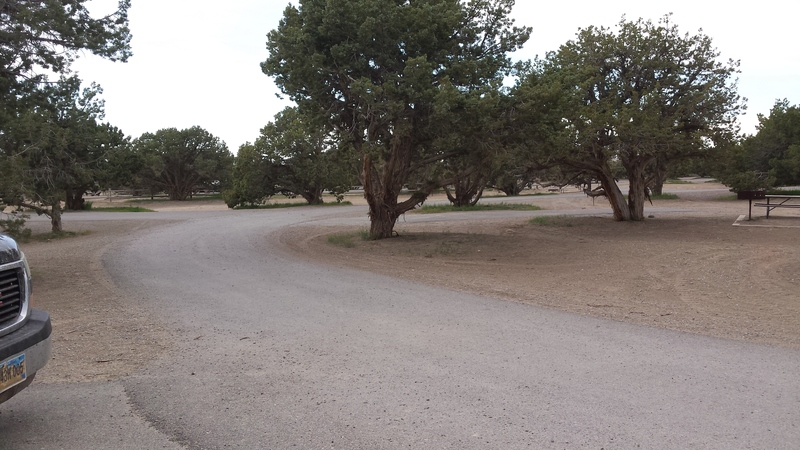 In the meantime, we are enjoying a peaceful wait in a nice desert campgound. The on again off again working of the furnace finally came to a head at a service center in Quartzsite AZ where it was determined that the burner was worn-out and needed to be replaced. Luckily, we had moved from Prescott back to the desert at Quartzsite where the weather was warmer because it took over two weeks for the new burner to get here for installation. It is now finally fixed and we are anxious to leave the desert heat again for the twenty degrees cooler temps in the Prescott National Forest. Some of the local shrubs are putting on a show here such as this pleasant parking spot at the Dollar General store. We left record breaking heat in the desert for the cooler higher ground at somewhere around 5800 feet. 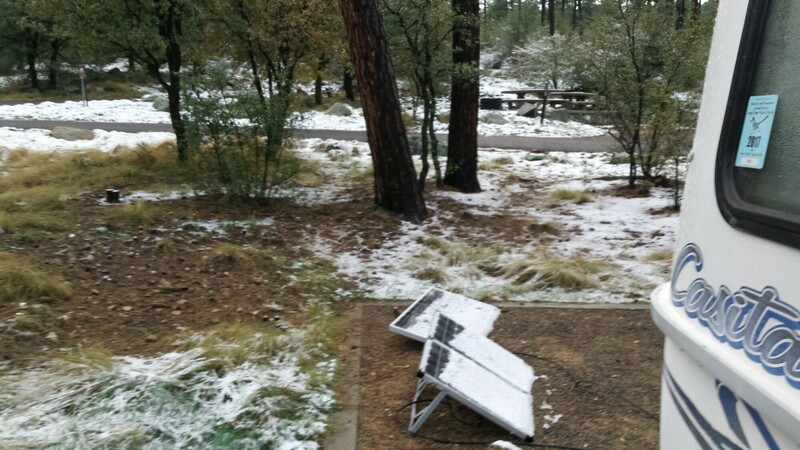 We got a little more than we wanted after a week of beautiful weather – 97 in the desert daytime then low 30’s and snow up here near Prescott AZ last night. Such is life. Weather in transition.